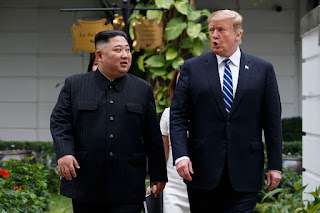 HANOI - The meeting between the president of the United States , Donald Trump , and the leader of North Korea , Kim Jong-un , ended on Thursday, 28, ahead of schedule and without agreement , the White House said . The two leaders leave the hotel in Hanoi where the summit was held after the suspension of a public ceremony that was scheduled. Trump advanced within two hours of his press conference, raising doubts about the progress made during the meeting. "Sometimes you have to go ahead, and this was just one of those moments," he told reporters. According to the Republican, the summit ended without agreement because he was not willing to suspend all sanctions against North Korea. "It was because of the sanctions," he emphasized. "Basically they wanted the sanctions to be lifted in their entirety, and we could not do that." Trump said that Kim offered to dismantle the Yongbyon nuclear research center in exchange for the suspension of all sanctions on Pyongyang and that was rejected by Washington. "Of course (that would dismantle Yongbyon), but he wants the sanctions to be suspended for this." However, Trump pointed out that he and the North Korean leader have a good relationship. "We like each other. There's a cordiality that I hope will continue, and I think it will." According to the US president, Kim has promised he will not resume nuclear or ballistic missile tests . "He said he will not test rockets, missiles or anything that has anything to do with nuclear." They have held "very good and constructive encounters," and "talked about ways to advance concepts related to denuclearization and the economy," said White House spokeswoman Sarah Sanders. "No agreement has been reached at this time, but their respective teams expect to meet in the future." There was no joint statement. Despite what Sarah Sanders said about a new meeting, Trump said he did not schedule another meeting with the North Korean leader. Asked about a third summit with Kim, the American said, "We'll see if it happens." Also during the interview, US Secretary of State Mike Pompeo said that Kim "was not prepared" to implement the denuclearization advances that Washington demanded of Pyongyang. "We asked him to do more, but he was not prepared for it," he pointed out beside Trump. "I wish I had made more progress, but I'm still optimistic about the progress we've made, and that put us in a good position to achieve a good result."